The sixth day of our road trip involved being in three states in one day and a whole lot of driving. Our day started in Montana, where the kids and I met an actual “cowboy” in the elevator who was in town to sell 25,000 cattle. 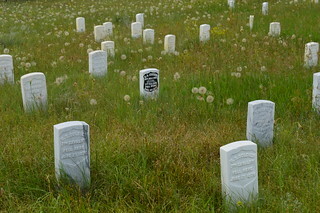 Our actual slice of Montana tourism, however, was our second National Park of the trip: the Little Bighorn Battlefield. Long time readers of my blog will be aware that Mr Pict is a history nerd with a particular fondness for military history. I share the love of history but am altogether meh about military history but I like a good stroll in open spaces so I happily tag along on his battlefield visits. 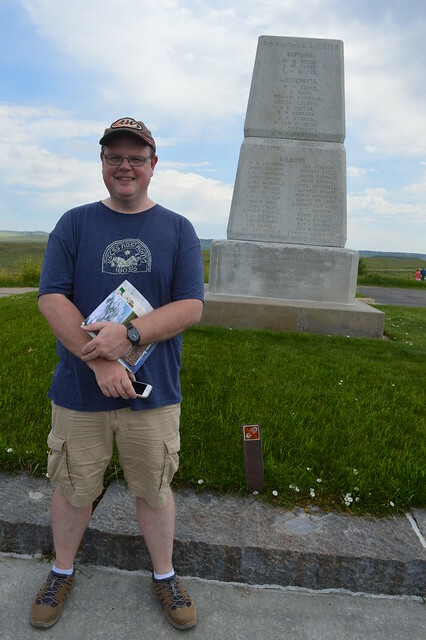 Mr Pict had recently read some books about the Little Bighorn so he was at peak geek for this visit. 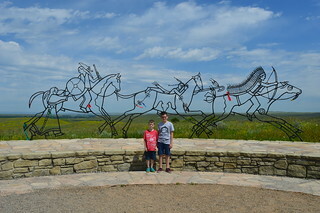 The Little Bighorn is, of course, 9in)famously the site of the 1876 battle between the 7th Cavalry and the people of the Lakota, Cheyenne, and Arapaho tribes. It was a pivotal moment in the relationship between the US government and the indigenous peoples of America. The Native Americans won the battle but ultimately lost the war. Knowing what the aftermath of this battle, the retaliation, had meant for the Native American population lent the whole place a poignancy. We started off at the Visitors Centre, which had an informative video and exhibits about and artefacts of both sides of the conflict. Our youngest son was also inducted as a junior ranger having completed the programme by answering a series of questions. 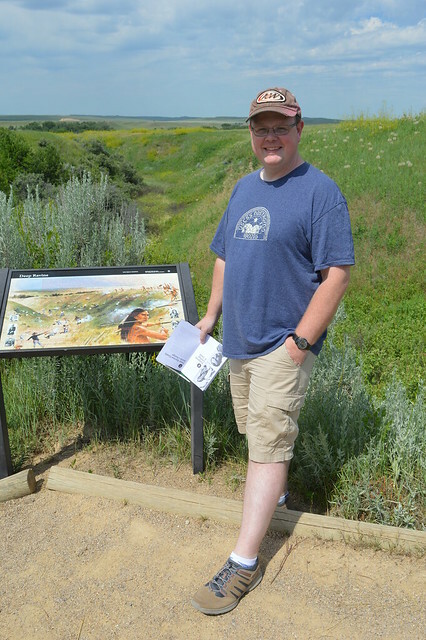 Mr Pict was in charge of directing our wanderings so we started with a hike down to the ravine where General Custer had envisaged he would attack but instead found himself attacked by Lakota warriors. Or maybe I am misremembering. It gets confusing because apparently thoughts about what occurred have evolved among historians over the decades. The Deep Ravine trail was, however, an easy walk and took us past markers for both US soldiers and indigenous warriors. I also encountered a couple of snakes along the way, though they quickly got out of my way. We were then led up to Last Stand Hill. It is marked with a granite memorial and is where members of the 7th Cavalry were buried where they fell. George Armstrong Custer’s marker is coloured black for easy identification and is adjacent to that of his brother. From there we strolled to the memorial for the Native American warriors who were killed in the battle. It was a beautiful and thoughtful memorial. I really liked the way that the view of the landscape was incorporated into the imagery. Back in the car, Mr Pict took us to the site of Reno and Benteen’s defense. 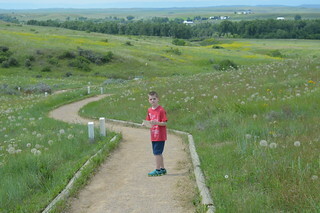 He and the two youngest kids walked the short trail to see specific sites. 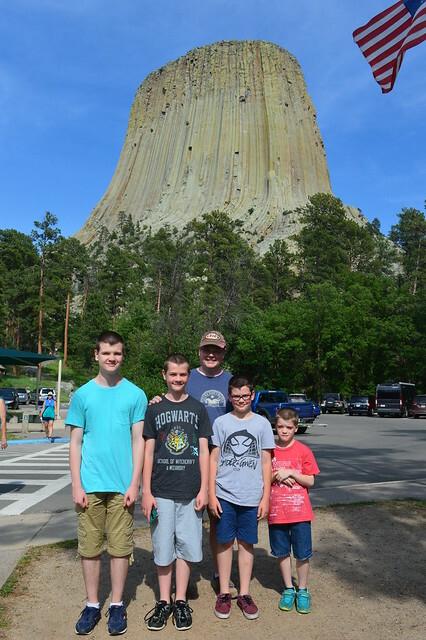 The two older boys and I, meanwhile, enjoyed sitting in the breeze and taking in the view of the valley – including the Little Bighorn River below – and spotting wild horses and another one of those skinny pale snakes. Montana was the first state of the day – and my 34th overall – and I entered my 35th state when we crossed into Wyoming in mid-afternoon. We were only in Wyoming briefly but I managed to legitimately claim it under my own rules because I had a snack and used a restroom. That might be TMI but those are the rules. 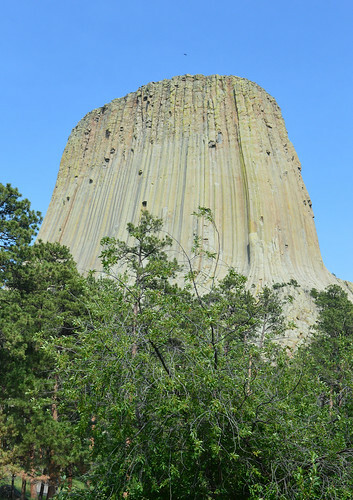 What we were in Wyoming to do was see Devils Tower, America’s first ever National Monument. This was another one of my long-held travel bucket list items. 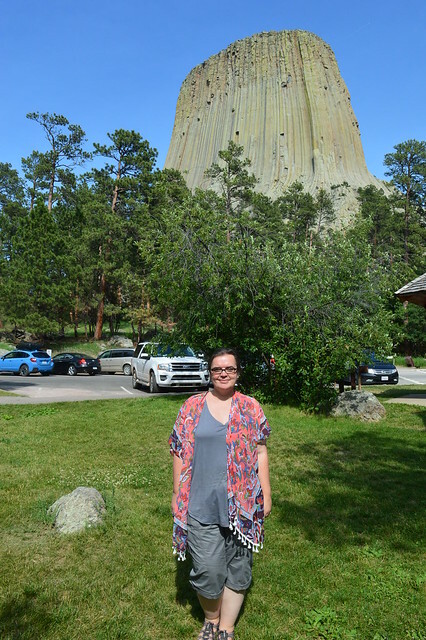 I have wanted to see Devils Tower for myself since I first saw the movie ‘Close Encounters of the Third Kind’ as a small child. The movie made an impression on me but so did the unusual shape of the mountain. Part of me was concerned that I would be underwhelmed, that seeing it in person would not be significantly different from seeing it in photographs or on film. My fears were allayed as soon as it came into view. It really is a striking mountain – or probably more accurately butte – and pretty breathtaking. Super impressive. Of course, I had to sing the tune that communicates with aliens while there, to the mortification of my offspring. I fully intend to explore much more of Wyoming on a future vacation but that wee corner of the state was it for this trip. By early evening we were in our third state of the day – and, of course, my 36th – when we entered South Dakota. We had booked to stay in a log cabin for a few days as a respite from being trapped in the car and covering so many miles per day. Finding the log cabin, however, proved to be a challenge. It was that problem again of having no cell phone connectivity to make our GPS work and of our road maps not being detailed enough to cover the roads we needed. Indeed, our log cabin was on the outskirts of a town (Lead – to rhyme with feed not fed) that only appeared as a dot in our mapbook. There was no way we were going to stumble across a cabin in the woods by chance, simply by driving around and hoping for the best. We, therefore, drove around Lead’s business district until I found an unsecured wifi connection I could piggy back on. Thanks to a saloon, I managed to connect for long enough to access a map. Finally we found the cabin. I would have sucked as a pioneer. I do .enjoy traveling with you. Seeing your family makes me happy. We raised 4 sons too and I do believe I would do it all over again. I love my grand-daughers but boys are special. I do have two grandsons but the five grand-daughers kinda over shadow. Thank you. 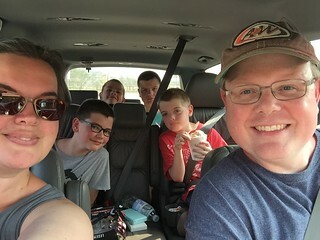 I’m so glad you are enjoying my travel posts and that it’s bringing back happy memories of raising your own four sons. Yay to 35 states! That is quite a menacing butte. I think that’s why mountains creep me out–they are so high up like that butte, intimidating and confining. I need the open land to feel like I can breathe. More like the battlefield–minus the snakes!! It’s a weird one, isn’t it? I’m rather fond of mountains though these days I prefer to be looking up at them rather than hiking up them. That is certainly the better choice of the two. The older I get, the more my heart speeds up going up stairs; I can’t fathom a hike up a mountain. BTW, my husband will be going camping this weekend (it’s 108 today if that tells you how crazy he and his bro are), and I will be waving to him from my air-conditioned front door as he leaves. I know you would also skip the tent. Your boys will be so glad to look back on this blog and be able to be reminded of their adventures, since boys don’t tend to record things as girls do. You are definitely going to be having the better weekend. That tent is going to feel like a sweat lodge. Thanks for sharing that thought about my blog. I often think about my photos as documenting family life so the kids have a visual index of their experiences but I, strangely, hadn’t thought of the blog in that capacity. 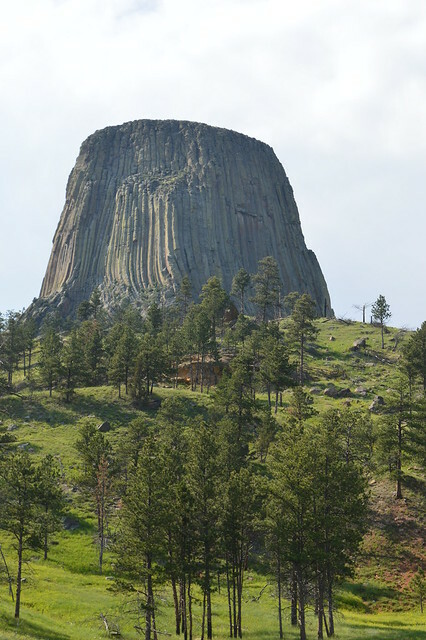 I saw a picture of Devil’s Tower after we got to Wyoming but there was no time to divert. It looks amazing! I saw Close Encounters when it first came out, but I didn’t remember it well enough to know that was in it. It’s just such an arresting feature in the landscape that it’s awe inspiring even wothoit the movie nerd appeal. Fun travelogue entry! It might be fun someday to self-publish in limited quantity, say one per kid, a printed book of your travels using your blog-posts as the text/illustrations. A keepsake for sure. All the best to you! That’s a nice idea! Before I blogged, I used to write travel journals, type them up, and print them. I like the idea of now using my blog posts as the travel journal.